Mosquitoes. Mosquito control officials in the Florida Keys are awaiting approval from the federal government to begin releasing hundreds of thousands of genetically modified mosquitoes to stop the spread of dengue fever. In many states, the threats of mosquito born disease have arrived. The Tiger Mosquito. Deadly House Mosquito and 150 varieties. Although reporters say, "no one knows how they got here," we must realize that Global Warming has changed our environment. With hotter temperatures, plus the increase in hurricanes and flooding, these insects thrive in humid, wet regions. Remove any standing water containers in your yard. The virus that causes dengue fever is called an arbovirus, which stands for arthropod-borne virus. Mosquitoes are a type of arthropod. In a number of regions, mosquitoes carry this virus and are responsible for passing it along to humans. Dengue fever cannot be passed directly from one infected person to another. Instead, the virus responsible for dengue fever requires an intermediate vector, a mosquito, which carries the virus from one host to another. The mosquito that carries the arbovirus responsible for dengue fever is the same type of mosquito that can transmit other diseases, including yellow fever. This mosquito is called Aedes egypti. The most common victims are children younger than 10 years of age. Dengue is caused by Flavivirus. Flavivirus has four closely related, but antigenically distinct, virus serotypes (DEN-1, DEN-2, DEN-3, and DEN-4), of the genus Flavivirus. Infection with one of these serotypes does not provide cross-protective immunity, so persons living in a dengue-endemic area can have four dengue infections during their lifetimes. Dengue is primarily a disease of the tropics. The viruses that cause it are maintained in a cycle involving humans and Aedes aegypti, a domestic, day-biting mosquito that prefers to feed on humans. Infection with dengue viruses produces a spectrum of clinical illness ranging from a nonspecific viral syndrome to severe and fatal hemorrhagic disease. Important risk factors for DHF include the strain and serotype of the infecting virus, as well as the age, immune status, and genetic predisposition of the patient. After the virus has been transmitted to the human host, a period of incubation occurs which lasts for about 5-8 days. During this period, the virus multiplies. Symptoms of the disease appear suddenly and include high fever, chills, headache, eye pain, red eyes, enlarged lymph nodes, a red flush to the face, lower back pain, extreme weakness, and severe aching in the legs and joints. This initial period of illness lasts about 2-3 days. After this time, the fever drops rapidly and the patient sweats heavily. After about a day of feeling relatively well, the patient's temperature increases again, although not as much as the first time. A rash of small red bumps begins on the arms and legs, spreading to the chest, abdomen, and back. It rarely affects the face. The palms of the hands and the soles of the feet become swollen and turn bright red. The characteristic combination of fever, rash, and headache are called the "dengue triad." No dengue vaccine is available. Recently, however, attenuated candidate vaccine viruses have been developed in Thailand. These vaccines are safe and immunogenic when given in various formulations, including a quadrivalent vaccine for all four dengue virus serotypes. Efficacy trials in human volunteers have yet to be initiated. Research is also being conducted to develop second-generation recombinant vaccine viruses; the Thailand attenuated viruses are used as a template. Therefore, an effective dengue vaccine for public use will not be available for 5 to 10 years. This analysis contains 312 remedies and 19 symptoms. ars. acon. sulph. lyc. arn. hep. lach. apis cupr. bell. ant-t. rhus-t.
Mosquitoes are known to carry many infectious diseases from several different classes of microorganisms, including viruses and parasites. Mosquito-borne illnesses include malaria, West Nile virus (WN), Eastern equine encephalitis (EEE), Western equine encephalitis (WEE), St. Louis encephalitis (SLE), La Crosse (LAC) encephalitis, dengue fever and yellow fever, Chikungunya, dog Heart Worm, and now Zika virus. Motorcycle Emits Non-Toxic Repellent to lower mosquito population in neighborhoods. Mosquitos kill more people every year than any other animal in the world, and in 2015 alone Thailand experienced more than a 207% increase in dengue patients, making it one of the worst years in recent history for this deadly mosquito-borne disease. The Duang Prateep Foundation, a non-profit charity dedicated to improving the lives of slum residents, wanted to do something about this, so together they created MotoRepellent to help combat mosquito infestation and mosquito-borne illnesses in the slums with motorcycles; because like mosquitos, they are everywhere. MotoRepellent is a light-weight, mobile device filled with non-toxic mosquito repelling oil and magnetically attached to the end of a motorcycle’s exhaust pipe. Heat from the exhaust activates the oil and mosquito-repelling scent is propelled out into the air via exhaust pressure. As the main mode of transportation in the slums, motorcycles easily navigate the narrow alleys and reach every corner. As the motorcycles pass by, mosquitos within a radius of up to 3 meters are repelled, giving residents a safer, mosquito-free environment. Saving lives one ride at a time. MotoRepellent : Saving Lives One Ride At A Time from BBDO Bangkok on Vimeo. "Best Practice and Creating Meaning in the Consulting Room"
Dr Gray's book provides us with practical advice about how to take a complete case in a wide range of clients. It is the first of a series of 6 volumes. The publisher: This book offers a thorough description of the history of homeopathy, and a glimpse into its future. The author faces contentious issues directly, and questions existing standards with rigor. 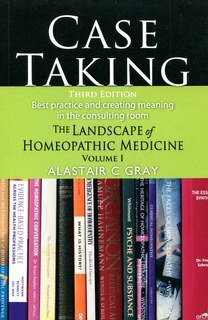 ABOUT THE AUTHOR : Alastair C. Gray heads up the homeopathy department at Endeavour College of Natural Health in Australia. He presents regular seminars at Kuala Lumpur, Toronto, Boulder, San Francisco, Galway in Ireland, Preston and Nottingham in England and Bangkok. He continues to teach the residential Fusion sessions, a post-graduate program in natural medicine, offered in New Zealand, Australia and online. In addition, Alastair runs a general natural medicine practice in the inner west and east of Sydney, Australia. Clinical practice remains a significant feature of his work with a focus in the treatment of anxiety, depression, addiction and men’s health. He has published four books and numerous articles on provings including Kauri, Moreton bay fig, Tea tree, Waratah, Tar tree, Liquorice, Cactus, Kowhai, Tuberculinum, Bacilinum, Mosquito, Cockroach, Toad, Seahorse, Pearl, Irukandjii, Medusa, Box jellyfish and White tailed spider. Thanks Debby for sharing this valuable point. Dengue fever is being successfully treated by homeopathy in areas where it is endemic. In this recent report from India, 50 patients with secondary dengue were given homeopathic Eupatorium perfoliatum (Eup-per), and all recovered. “The platelet counts came under control for almost all patients and blood tests showed marked improvement…In allopathic medicine, there is no drug for this disease. The only treatment is IV fluids to replace body fluids. Most patients we chose for the study had platelet count less than 10,000. We prevented death and blood transfusion in all the 50 patients who took this drug,” said Dr Gunasekaran. The doctors involved in this recent study said that Eup-per has been used at other localities and in government hospitals. more info added on Dengue Management and Prevention Using Homeopathy The epidemic of dengue has again resurfaced in Delhi after a gap of six to seven years. Several patients are reporting in different clinics and hospitals of Delhi. Govt. as well as civic authorities are facing lot of problems in tackling this scourge of dengue virus. Thank you all for the informative discussion. I would like to add a line regarding the after effects of dengue fever, i.e. extreme prostration and weakness. CADMIUM SULPH is a medicine which helps to remove this severe prostration after dengue fever. You are absolutly right Debby. We find good results in influenza,cough & cold also. Dulcamara, Nat.Sulph & Aconite also providing good result..
Dr. Rajneesh ,because of main title "Dengue",i didn't mention other diseases. Because Dengue shows similar symptoms to influenza at the onset the above remedies indicated by Dr Prabhat also work for flu epidemics.